My stove has been broken since Saturday and according to the repairman, it’s going to remain broken for the remainder of the week! I had the faintest glimmer of hope that it would be fixed today, but of course, there were parts that had to be ordered from Timbuktu. I suppose I should be grateful that Timbuktu has rush delivery; and really I am…but I’m honestly feeling very out-of-sorts right now! I tell you, nothing irks me more than things being broken, undone or under construction at home–not to mention being really tired of getting takeout! 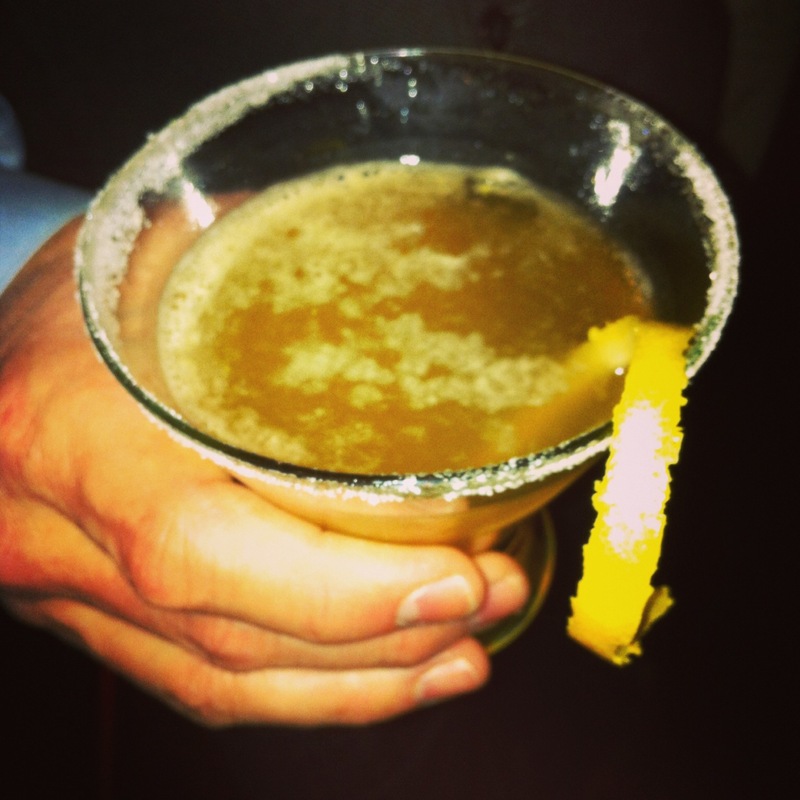 So, in lieu of a recipe, I wanted to show you what I got up to this past weekend: I went on my first Downtown Pub Crawl! I will be the first person to confess that I have not spent nearly enough time exploring the revitalization projects going on in Downtown Las Vegas! I’ve been to the Smith Center for the Performing Arts, which is an awesome and wonderful addition to our city. I’ve also spent time in the Downtown3rd area, having dined at the Triple George Grill numerous times. 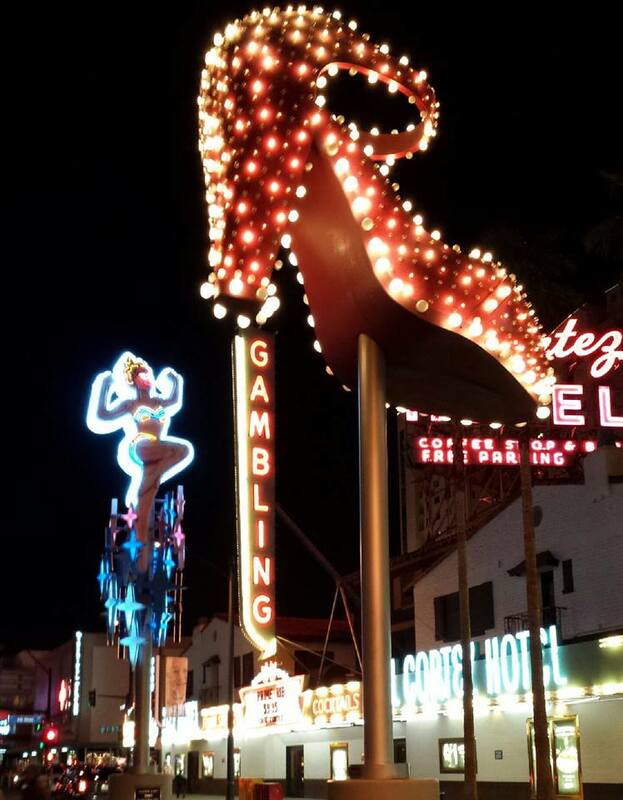 But, until last weekend, I had not experienced Fremont East! I felt like a tourist in my own town! The Downtown area has been undergoing a bit of a renaissance thanks to the Downtown Project, spearheaded by Zappos CEO, Tony Hsieh. I admit, I was pleasantly surprised and a lot thrilled at the atmosphere down there! 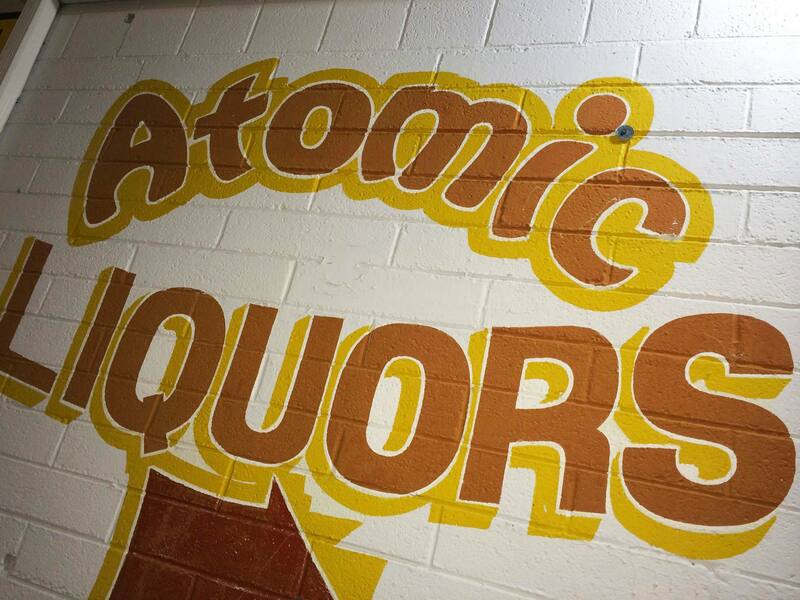 We started the evening at Atomic Liquors located at 917 Fremont Street. Atomic Liquors is the oldest drinking establishment in Las Vegas and I was told that during the 1950s, people would enjoy a cocktail on the rooftop while watching the atomic blasts at the nuclear test site! There we enjoyed a very well-crafted Tom Collins and a Sidecar. You know you have found a good watering hole when the bartender can make a good, classic cocktail. From there, we walked a few blocks to the recently opened Container Park where we had a couple of cocktails at The Boozery. I had a “Dark and Stormy” which consisted of dark rum, ginger beer and lime! I’m definitely going to try to replicate that one at home! By this time, I was starting require a little more food in my belly, so we ventured over to Chef Kerry Simon’s Pork & Beans for “The World’s Best Hot Dog” and some thick and spicy chili! 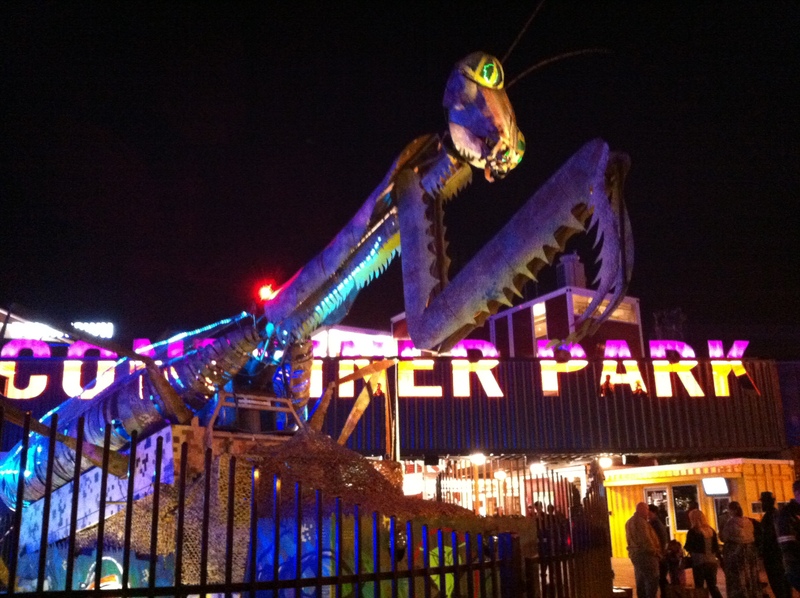 We were greeted by this huge fireball spitting Praying Mantis sculpture! 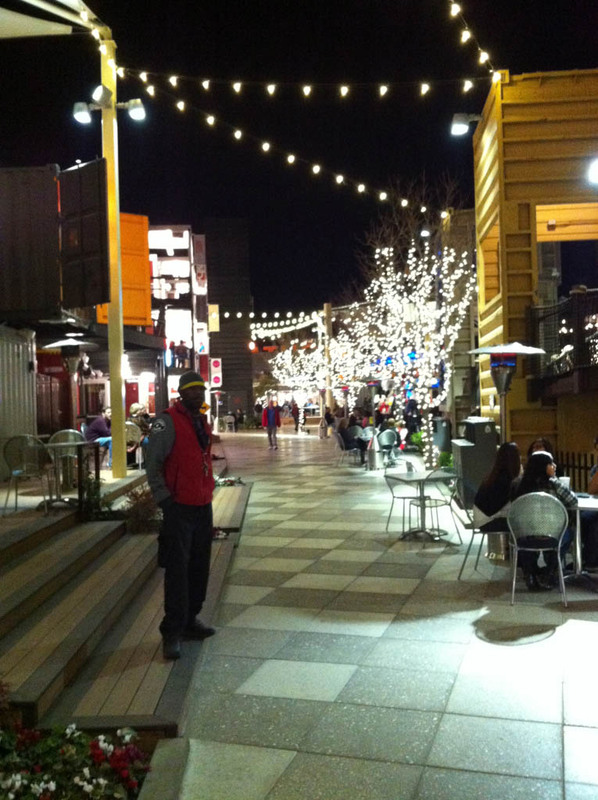 Shipping containers house all of the shops and dining spots (hence the name Container Park), so the spaces are cozy! The next stop was the Vanguard Lounge, which that evening wasn’t crazy crowded, so it was a nice space to kick back for a few minutes. 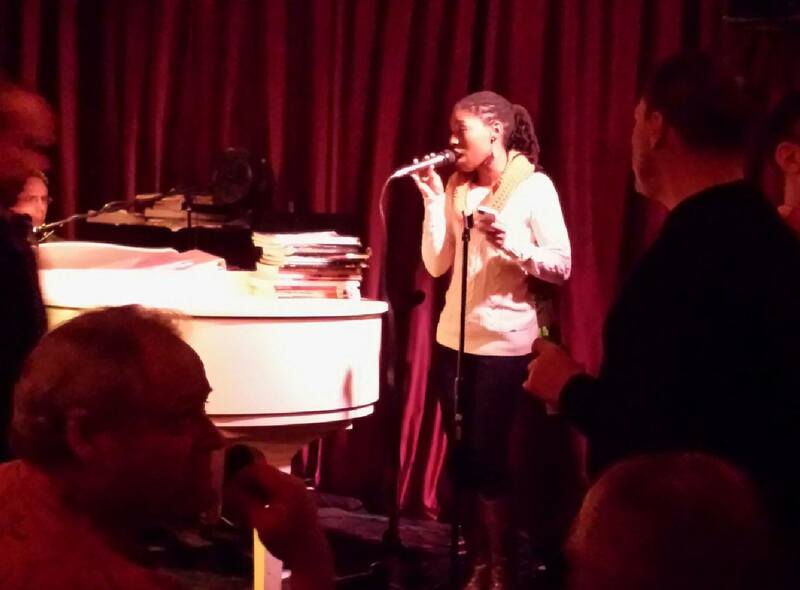 After that we headed over to the piano bar Don’t Tell Mama, where somehow, I ended up onstage singing “Cups”! See what happens when you drink? Our last stop of the evening was the Downtown Cocktail Room, which was downright swanky and sophisticated. The mixologists made me a thoughtfully crafted cocktail that I cannot find on their menu, but it was frothy and spicy and I suspect it contained ginger and possibly egg white–it was fantastic! One thing I really enjoyed about the “DCR” is that it was very spacious, with comfortable chairs and couches, and the music wasn’t so loud that you couldn’t hear a conversation. To me, that’s a perfect nightspot! So, if you’re visiting Las Vegas or if you live here, be sure to check out these great spots Downtown–you’ll be glad you did! Special thanks to my good friend, Victor Rodriguez of Eurie Creative Design Firm, who organized and hosted this event. Now that’s a side of Vegas that I need to see! I love the container concept, the well-crafted cocktails, the relaxed spaces, and the piano bar interlude! A perfect night. Aren’t Dark & Stormies delicious? They are really easy to replicate and I’ve started making a variation — replacing the dark rum with Bullit rye whiskey — that is excellent. Throw some ice into a tumbler, add in a short of rye whiskey, pour over about a 1/2 a bottle of ginger beer, add a healthy squeeze of lime juice, and you’re in heaven. It really was a different side of Vegas–I almost felt like I was in an entirely different city! The Dark and Stormy was SO good! I’m going to take your idea and make it with the rye! Sounds incredible! Thank you for the suggestion! If you come out this way, look me up and I’ll show you around!